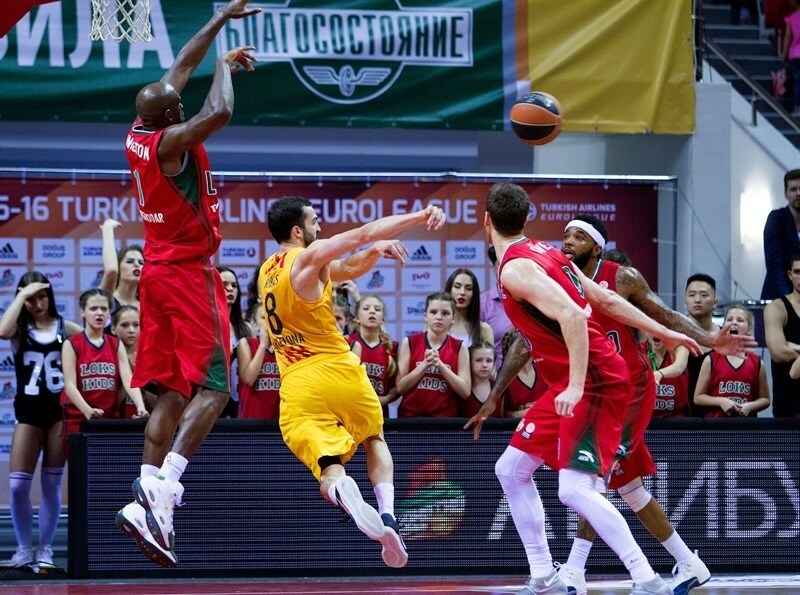 In a battle that went down to the final seconds, Lokomotiv Kuban Krasnodar recorded its first-ever Turkish Airlines Euroleague playoffs win by edging FC Barcelona Lassa 66-61 at home in Game 1 of their best-of-five series on Wednesday. Lokomotiv has a 1-0 lead in the series and hosts Game 2 on Friday. 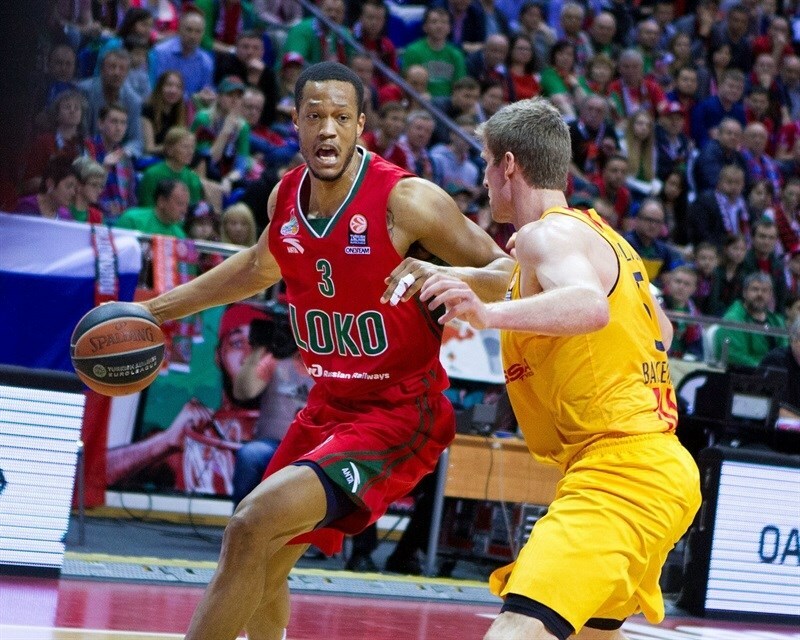 Anthony Randolph led the winners with 17 points and 10 rebounds and Malcolm Delaney added 11 points, 5 rebounds and 7 assists for Lokomotiv. Justin Doellman and Pau Ribas led Barcelona with 13 points apiece and Alex Abrines added 10 for the guests. Doellman had 7 early points to give Barcelona a 3-8 lead. A three-pointer by Delaney capped a 7-0 Lokomotiv run and gave the hosts a 10-8 edge. 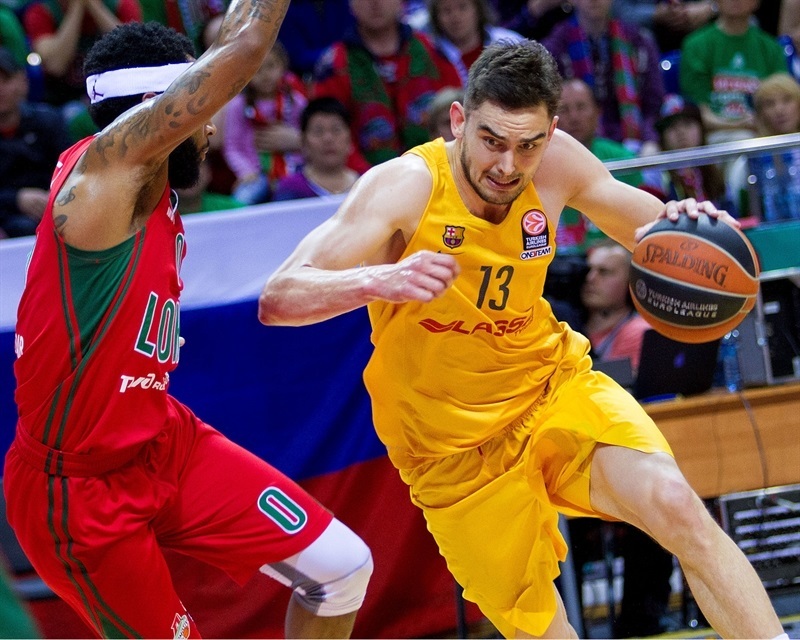 Ribas and Tomas Satoransky stepped up for the visitors, allowing their team to regain a 17-19 advantage after 10 minutes. A driving layup by Stratos Perperoglou boosted his team's lead to 19-28 midway through the second quarter. Victor Claver and Ryan Broekhoff kept the hosts within 27-33 at halftime. Barcelona led most of the way in the third quarter, but a three-pointer by Matt Janning got the hosts within 1 late in the quarter. 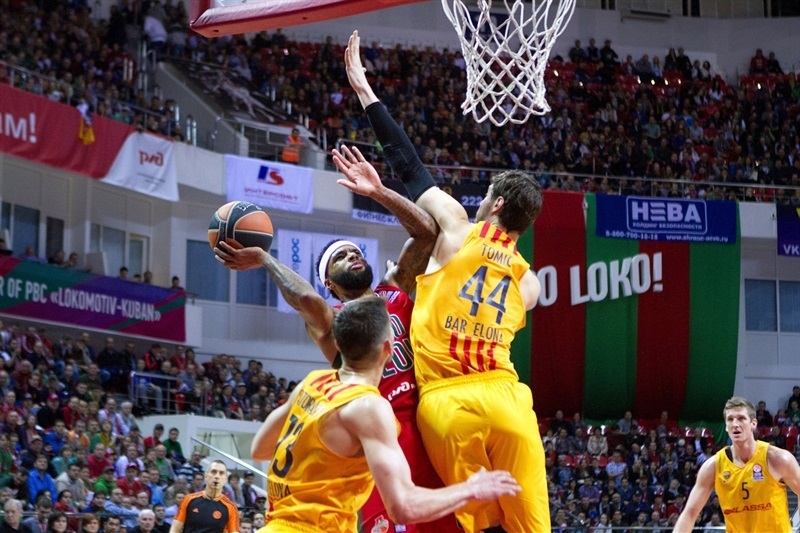 A layup by Abrines gave Barcelona a 58-61 lead with four minutes left, but Barcelona was held scoreless in crunch time, while, Chris Singleton, Delaney and Dontaye Draper fueled a final 8-0 push, which Ryan Broekhoff capped with a dunk to give Lokomotiv the lead in the series. Doellman got Barcelona going with a five-meter jumper and soon added a three-pointer for a 0-5 lead. 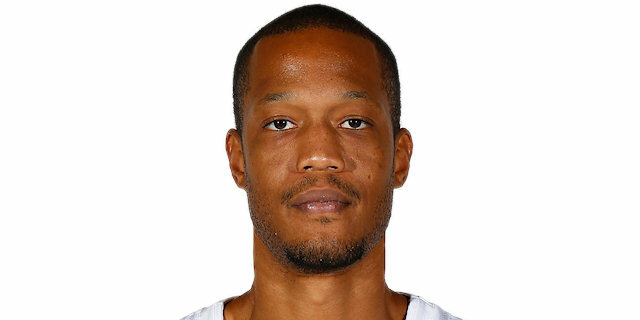 Lokomotiv was held scoreless for more than two minutes until Randolph stepped up with a layup-plus-foul. Doellman kept pushing Barcelona with a mid-range jumper and a free throw by Joey Dorsey boosted his team's lead to 3-8. 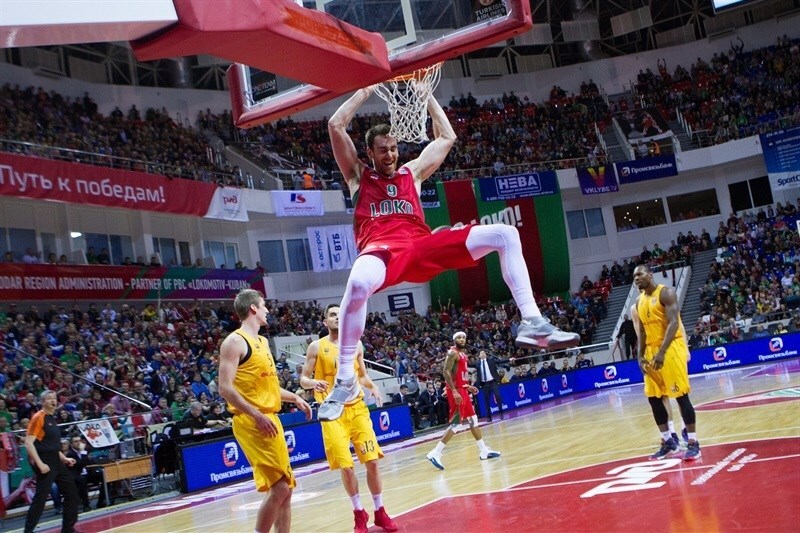 Delaney fed Claver for an uncontested dunk and Randolph swished a five-meter jumper to bring Lokomotiv within 7-8. 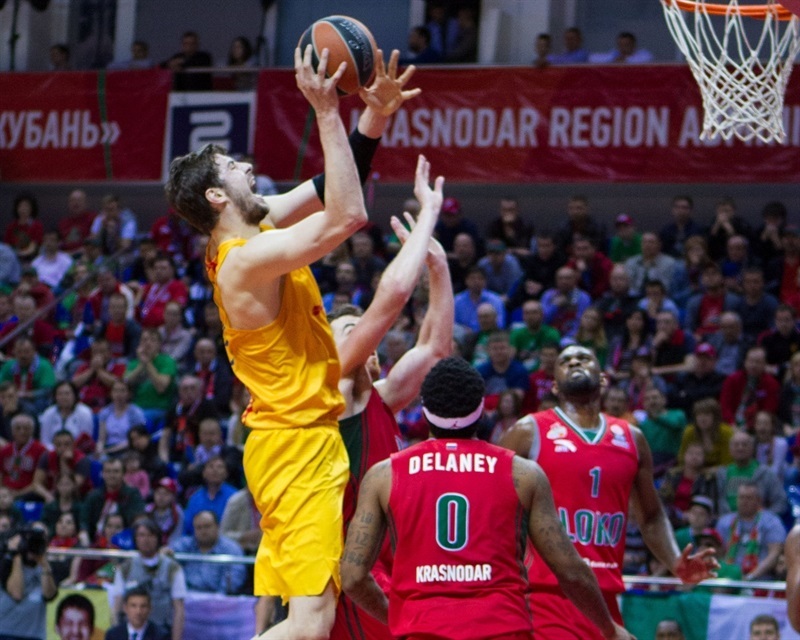 Delaney buried a three-pointer in transition to cap a 7-0 Lokomotiv run. Doellman stepped up with a fast break slam to even the score at 10-10. Abrines took over with a jump hook and Satoransky followed that with a coast-to-coast layup that gave Barcelona some fresh air. 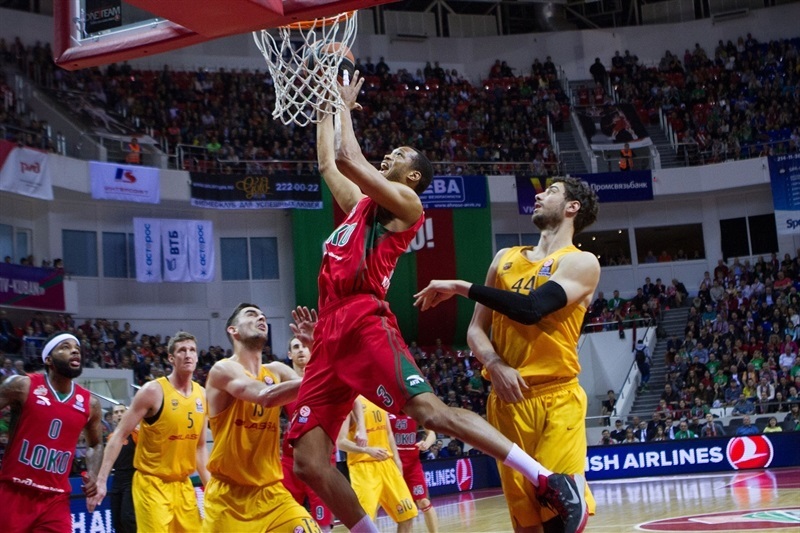 Randolph and Sergey Bykov made free throws, but Ribas improved on them with a three-pointer and a one-handed floater. A three-point play by Chris Singleton made it 17-19 after 10 minutes. 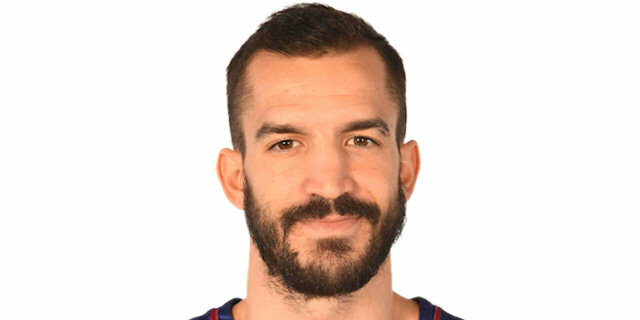 Ante Tomic beat the shot clock with a fall-away jumper early in the quarter and Samardo Samuels added a power layup that made it a 6-point game. Lokomotiv kept missing open three-point shots, so Broekhoff tried to change things with a dunk in transition. Tomic hit a jump hook off a high post pick and a free throw by Samuels boosted the guests' lead to 19-26. Perperoglou took over with a wild driving layup, as Lokomotic kept struggling to find the way to the basket. The hosts improved their ball circulation with Delaney back on the floor. Claver stepped up with his trademark corner three-pointer and Matt Janning added free throws to bring Lokomotiv within 24-28. Carlos Arroyo and Draper exchanged three-pointers and a reverse layup by Doellman gave Barcelona a 27-33 margin as both teams headed back to the locker rooms. Broekhoff made free throws immediately after the break, but Juan Carlos Navarro found Tomic for a layup and a 29-35 Barcelona lead. Randolph nailed a five-meter jumper and hit foul shots to tie the game at 35-35. 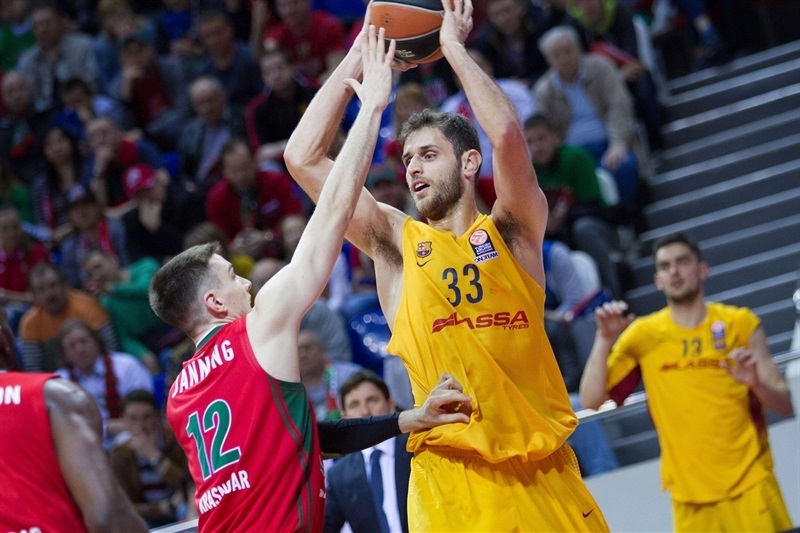 Barcelona struggled to find good options on offense, as Lokomotiv's defense forced the guests to take late, off-balance shots. Abrines rescued Barcelona with a three-pointer and Doellman added a fast break layup for a 5-point edge. After Navarro buried a six-meter jumper, Randolph and Abrines exchanged three-pointers. 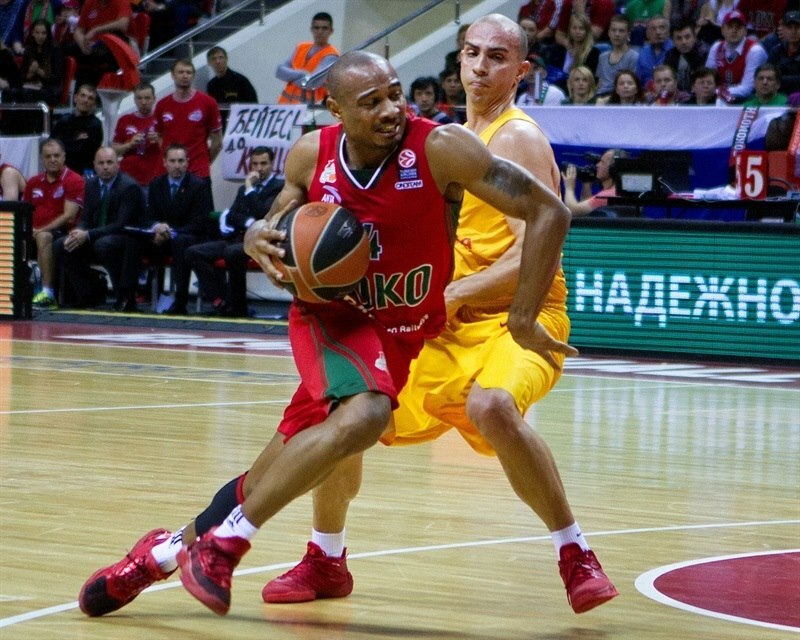 A jumper by Delaney brought Lokomotiv within 40-45. Tomic hit a jump hook that Claver matched with a backdoor layup. Ribas hit a jumper, but Delaney singlehandedly brought the hosts as close within 3. 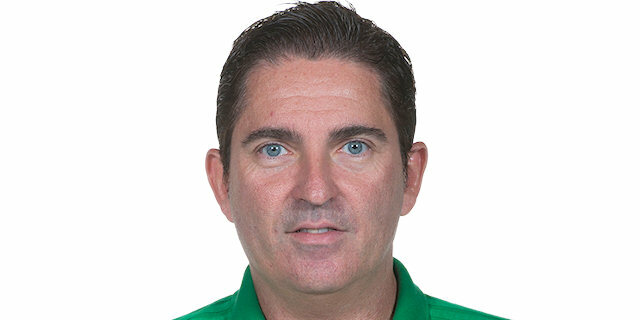 After Randolph split foul shots, Ribas’s free throws kept Barcelona ahead. Janning nailed a three-pointer, but a buzzer-beating jumper by Sasha Vezenkov fixed the score at 50-53. Singleton sank a mid-range jumper early in the quarter and a put-back basket by Broekhoff completed the hosts' comeback at 54-53. Samuels stepped up with an off-balance basket, which Singleton matched with a turnaround jumper. Ribas found space for an uncontested driving layup that put his team back in charge, 56-57, with six minutes to go. 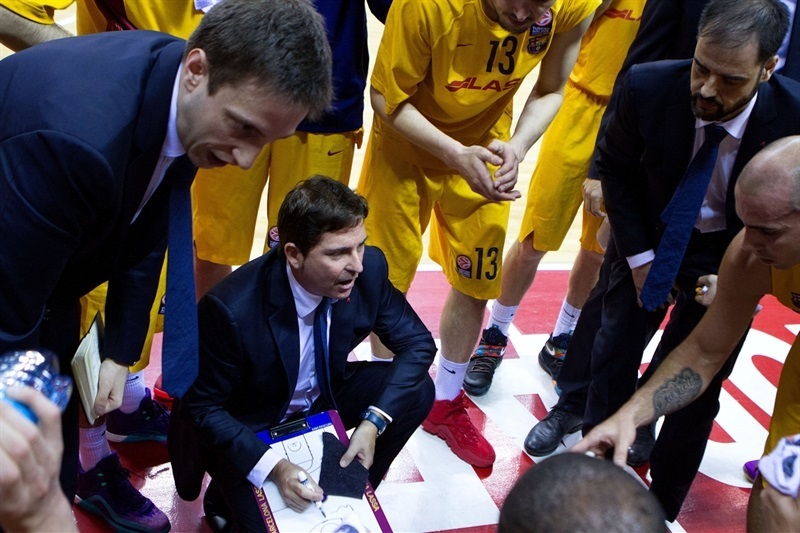 Lokomotiv called timeout, but Ribas kept pushing Barcelona with a mid-range jumper. 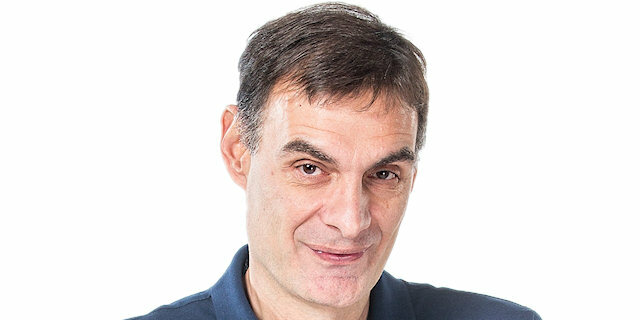 Draper shined with a six-meter jumper off the dribble that Abrines erased with a driving layup for a 58-61 Barcelona lead. Singleton scored around the basket and Draper sank a mid-range jumper off the dribble, after which Barcelona called timeout with 1:34 left. Ribas stepped out of bounds and Doellman missed down low, before a layup by Delaney gave his team a 64-61 lead. Abrines missed from downtown and a dunk by Broekhoff sealed Lokomotiv's first-ever Euroleague playoffs win in style! "It was a very tough game for both teams, the typical first game of a playoffs series. We were nervous in the first half; that is why although we created many open shots, having patience on offense, we were very nervous and we didn't make them. With these percentages, around 20% from three and around 30-34 from two, we were 6 points down at halftime. We said in the locker room that we had to calm down and keep playing our game. We were very consistent, very patient in this game, just waiting for our time. When we had it, we were very decisive to do what we know well. Obviously, Barcelona is a great team. They have very experienced players and that is why they punished us 10 points at the end of some special offenses, some out of bounds plays that gave them some baskets. They also had many offensive rebounds, but even in this situation, we allowed 8 points in the fourth quarter, which was, for me, crucial to finish the game with a win. I have to say congratulations to the team, the players and the fans. There was a great atmosphere, a great Euroleague playoffs game. Both teams very much want to go on to the Final Four. Right now, I have to say we have to control our emotions. Win or lose, this is what you want to do - control your emotions, analyze the mistakes you make and try to avoid them in the upcoming game." "First of all, congratulations to Lokomotiv Kuban for its win. It was a game in which we have the feeling that it was in our hand and slipped away in the final moments. I think that, in general terms, it was a typical playoffs opener, with a lot of nerves on both sides, which made the game a little bit imprecise. On the other hand, both teams played good defense. That is why we are two of the best defenses in the competition. Even with this, we dominated the game for the best part of it until the final moments, in which small details made us lose the game: two missed two easy shots and a final action in which Delaney hit a layup. We felt that we had the game under control and that Carlos [Arroyo] was leading us in this game. When you lose, you can always look back and think you could have won with different decisions, but we thought we had a good control of the game. I think we played good during some parts of the game, but were not at out level in the fourth quarter. 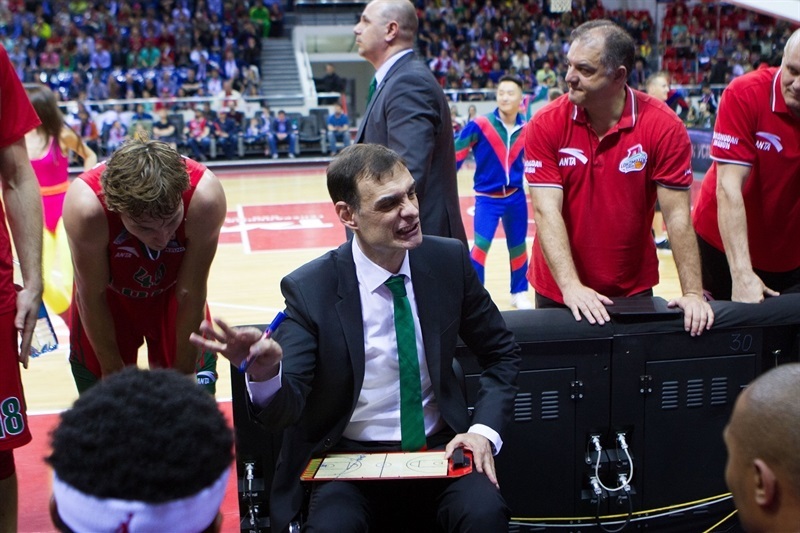 I have a lot of respect for Lokomotiv and its coach. It is a very, very difficult opponent." "I think it was a good game. Both teams came out to play and it was a tough defensive game. We were lucky we got stops towards the end of the game and made some big shots. Basketball is a game of runs and ups and downs. All that matters is that when the final buzzer sounds, who wins the game. I think they have a lot of pressure on them and all we have to do is keep playing basketball." "This is an opportunity that we missed. We made bad decisions in the end and that made us lose the game. It was a balanced game in which any team could have won but it is clear that we have to bounce back and play better on Friday to get a win we couldn't get today. Win or lose, the mentality would have been the same for our next game and this is what we will do. This is FC Barcelona and we can beat any team, anywhere if we play well on offense and defense. It was hard for us today on offense and not everything we prepared went well. We will work until Friday to see which details did not go well in order to play better offense. We have to come back and try to win Game 2; the team will be mentally prepared to do things better. Game 2 is a key one in the series."